Kazakhstan (or is it Qazaqstan?) switches to Latin alphabet. 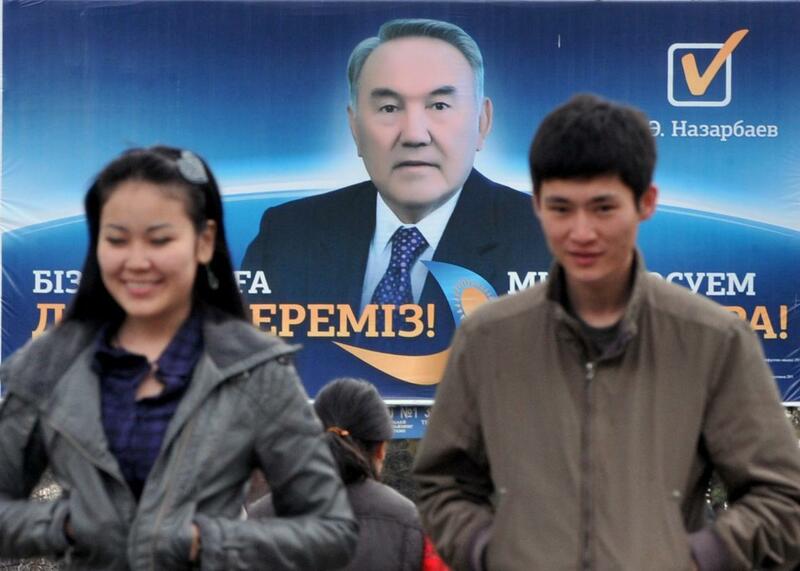 People walk by an election poster of Kazakh President Nursultan Nazarbayev in Almaty on April 2, 2011. Kazakh President Nursultan Nazarbayev has ordered that his country’s official alphabet be changed from Cyrillic to Latin. For Kazakhstan, this is symbolic distancing of the former Soviet state from its neighbor, Russia. For the rest of us, it raises a question of how we’re now supposed to spell the country’s name. Reuters notes that this is actually the third time that the country’s alphabet has been changed in a century. Until the 1920s, Kazakh, a Turkic language, was written with Arabic script. Then, the occupying Soviet Union briefly changed it to Latin, and then to Cyrillic in the 1940s. Another justification for the new switch is ease of use with digital devices: Cyrillic’s 42 characters can be tough to shoehorn onto keyboards designed with the Latin Alphabet in mind. “A standard Kazakh keyboard utilizes almost all number keys in addition to letter and punctuation keys,” according to Reuters. In general, non-Latin scripts have had a hard time making the transition to an internet still largely dominated by English. Then there’s the name issue. In Kazakh Cyrillic, Kazakhstan is spelled: Қазақстан. In the official spelling system the government has adopted, the letter Қ with a descender—which doesn’t exist in Russian—will be replaced by Q. The country’s name will therefore be spelled Qazaqstan. It’s not clear whether Kazakhstan, or Qazaqstan, plans to make this the official English spelling of its name, but if it does, that will take some getting used to.